Why India’s left collapsed and why its political future is with the right. Political scientists in the United States divide American political history into several “party systems,” which refer to periods characterized by certain political alignments and features. For example, the period during and after the American Civil War is known as the Third Party System and was characterized by the dominance of the Republican Party, which won the war, ended slavery, and presided over a period of industrialization. The evolution of party politics through a number of systems is characteristic of most democratic countries. Similarly, India is currently in the process of undergoing a new political alignment with distinct characteristics. While the periodization of India’s political systems is debatable, it is generally accepted that prior to the current political alignment in India, which features a party from the right attaining a majority in India’s Parliament for the first time, there were at least two major political alignments in independent India’s history. The first political alignment began when India became independent and lasted till around 1989. It was essentially a one-party, albeit democratic political system under the leadership of the Congress Party, except for a brief period between 1977 and 1980. The Congress Party started out fairly close to the left of center and began moving progressively toward the left during this period, especially after Indira Gandhi created her own Congress Party that absorbed the original one and became the “true Congress” in the early 1970s. The Congress Party’s main competitors during this period were mostly leftist parties like the Communist Party and others that would often admonish the Congress Party for not being socialist enough, causing that party to shift leftwards. India’s political spectrum during this period was mostly leftist, despite the presence of many right-wing organizations. At the time, leftist politics seemed to be the obvious path for a poor, post-colonial country with hundreds of millions of poor farmers. However, leftism eventually failed in India for many reasons — and not just economic ones — though the Congress Party survived because it moved back toward the center and allowed for some market reforms while still doling out favors to many poor groups. Formal leftism, politically and intellectually, failed in India by the 1980s and is currently on its way to near-extinction in India’s political landscape. This is not surprising at all, since India’s social structure is not at all conducive towards leftism. What is surprising is that most Indian political parties tried to “out-left” each other for much of India’s history, despite the failure of leftism to lead to genuinely large-scale modernization among the Indian masses. Unlike China or some other East Asian countries, India’s social structure and village life is not collectivist and there is no one single large class of peasants or workers that would be ideal for a leftist mass movement. In general, Indians are much more individualistic and geared toward personal as opposed to collective success than most other Asian countries, according to a study. India’s social structure is a dense network of thousands of castes who do not see eye to eye. The Congress Party managed to retain power for India’s first few decades by catering to multiple interests without introducing too much change. For a long time, this kept Indian politics from fragmenting along caste or regional lines while social groups were not modernized enough to form new coalitions. Thus, India’s social structure makes massive, populist agitation difficult and shifts the focus of mobilization to identity. In India, people from lower-caste and poorer backgrounds don’t necessarily want the abolition of religious and social structures but want to attain a higher position within these structures. Indians are also religiously oriented. These facts led to the shift of Indian politics toward much more fragmentation along caste and regional lines after 1989. Many of these parties are theoretically leftist but mostly only so in the sense that they use the power of the government to dole out favors to their supporters and castes. However, the electoral base of these parties, such as the Samajwadi Party in Uttar Pradesh, is very narrow. The period between 1989 and 2014 was dominated by many of these parties, leading to an era of fragmentation and coalition governments on both the state and federal level. In 2014, however, India entered a new stage of political alignment with the rise of the right: one single, strong right-wing party as opposed to a multiplicity of right parties. While the right-wing Bharatiya Janata Party (BJP) had held power before 2014, this year’s elections marked the first time a right-wing party held power on the federal level without forming a coalition. While much of the BJP’s success is due to Prime Minister Narendra Modi’s popularity, there are deeper structural factors as well. The Indian right has been able to consolidate society, especially Hindu society, much better than the left. Center-left parties like the Congress Party did not do much to change the status of lower castes or poorer groups. Communist parties sought to abolish social structures when in reality lower-caste and poorer groups wanted a respected place economically and within Hinduism rather than a socialist paradise. The Hindu right was able to consolidate multiple caste groups into a somewhat homogenous Hindu identity that gave everyone the type of satisfaction they wanted. Beyond the consolidation of many groups under a common identity, India’s right was able to expand its appeal by focusing on the issue of development and economic growth as opposed to handouts. This appealed to a wide range of people, including those who wanted better economic opportunities and those who wanted the quality of governance in India to improve. The BJP has severely undercut regional and caste based parties this past year by promising better governance through larger mandates and by promoting a more pan-Indian nationalist ideology. These factors are leading to the steady consolidation of the right in India in a way that has not been achieved before while regional and left wing parties flounder. As a result, India’s political spectrum is in the process of shifting to the right. Even though this will never be a total shift, the language of Indian political discourse has shifted in that direction both with regard to economic and social matters. 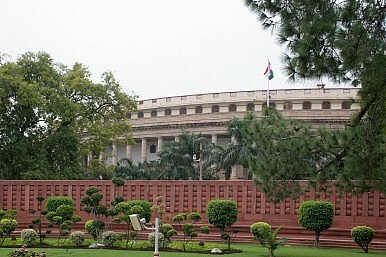 In some ways, India’s political system is beginning to resemble the American political system. As in the United States, the far left is becoming marginal. The main left-wing parties in both India and the U.S. are center-left parties that are not intrinsically opposed to markets. On the other hand, the right in both the U.S. and India encompass a broader spectrum, with two active wings. On one hand, in both the U.S. and India, there are pragmatic center-right individuals whose focus is on economic and (in India’s case) developmental issues. On the other hand, the right in both nations features individuals farther to the right of the pragmatists who are highly ideological. Alternatively, the Indian system can possibly move towards something resembling Japan’s system, with a single, dominant right-wing party with many factions within the party. This would not be too different than India’s government under Congress during its heyday, with the important difference that while there is a lot of internal democracy in the BJP, the Congress has been controlled by one family for decades. What is clear is that the era of political fragmentation in India is likely over because Indian voters have seen its negative aspects and because the narrative has shifted to development rather than identity politics. In this environment, the BJP’s concerted push for majority governments under a single national party devoted to development and nationalism will continue to have strong appeal. What remains to be seen is if India will evolve into a stable two-party system or if there will be a new single dominant party era. Is the Modi Government's Moment of Reckoning Here?Could 6 Socialist Parties Derail Modi’s Political Hopes?India's Parliament Will Have No Opposition LeaderModi and India's New Political EraIndian Elections 2019: Do Narendra Modi and the BJP Deserve a Second Term?